I had some time to kill on a random Friday and found myself wandering around the Financial District downtown. Specifically Kearny Street which is lined with small run in and or sit down restaurants that cater to the many day workers in the neighborhood. It's just past 11:30 am so things are not quite crowded yet so I stop in at Darn Good Food. 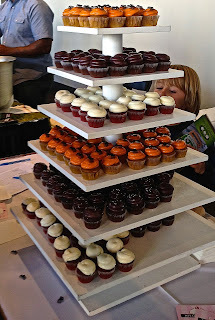 And so it was that I found myself with an invite to a food blogger festival here in San Francisco. Put on by the DailyBuzz Food folks of Federated Media it brings together about 300 people from (almost) all across the country to schmooze and eat in San Francisco. 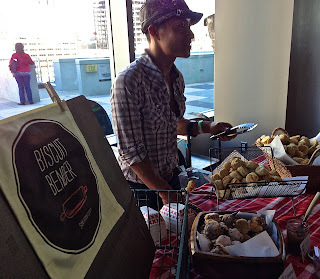 This is the fourth year of the event but my first attending as I only started "food blogging" about a year ago. That's right people--I'm officially a food blogger and you are reading a food blog--and there you have it. So let's talk about some food then. One of the most looked forward to events (I was told) is the Taste Pavilion. Held at City View at the Metreon it's a giant open space with an outdoor area that overlooks Yerba Buena Gardens and parts of downtown. There were a large variety of vendors there, you can check out the list here, and after nibbling bites at the first few tables me and the SO decided to pace ourselves by picking and choosing what to sample as there was usually plenty to go around. We basically ended up just bypassing the healthy granola stuff (of which there seemed to be many) and tried everything that is bad for you, but tastes so good. There were four that I really enjoyed and wanted to highlight here. 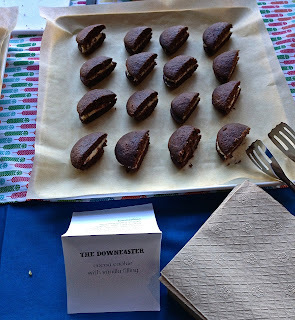 First up was After Suppa and some whoopie pies. These were really delicious. A dense chocolate cake with a creamy buttercream filling. Like a cakey version of an Oreo, only better. She had baked all these at her home the night before and she's trying to get her business off the ground and money she makes goes back to local schools. 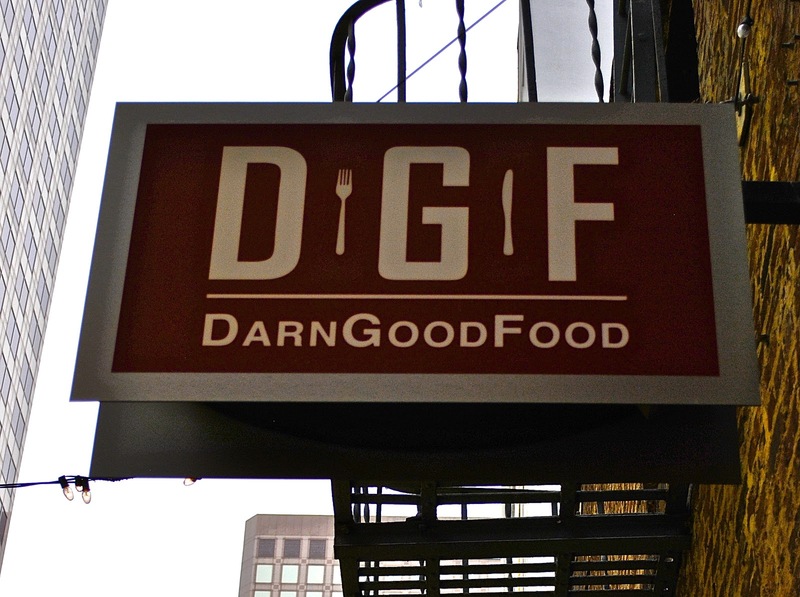 Nice lady, good food, good cause--you can't go wrong. More chocolate delights came from Kika's Treats. I was a big fan of the carmelized graham crackers covered in pure milk chocolate--yum. 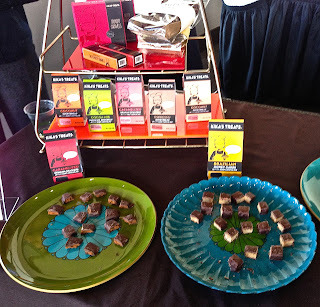 They also had palm sugar caramels covered in dark chocolate and sprinkled with sea salt--chewy goodness. Next up was Mission Minis. Located in the Mission near 22nd street they specialize in mini-cupcakes (they will do regular size on special order if you like) and what's better than minis? Going small lets you get just the perfect bite of different flavors like their red velvet, double chocolate or seasonal favorite pumpkin spice. My final pick is the Biscuit Bender. Traditional Southern biscuits are sometimes hard to come by in San Francisco and while his are not the classic light flakey, fluffy variety, they are not totally a scone either. More like a happy medium between the two. My choice is the double bacon maple and he was serving it up with some of his homemade jams so I smeared on the apple pie and the combo was outstanding. (Though maybe bring a little butter next time?) He has a kiosk in the Ferry Building and you should make sure to stop by and try one of his many flavors. All in all, the SO and I left happy and full from what I will now call the gorge yourself pavilion, because that is what we did. Now if you will excuse me I have to go run 10 miles to burn some of these calories--ahh, the life of a food blogger. RICH TABLE IN HAYES VALLEY...IS IT REALLY UP TO ALL THE HYPE? Expectations can be a double edged sword, if too high you can be disappointed when they aren't met, though if too low you can be pleasantly surprised. So it was that I made reservations to try out Rich Table, a newbie spot in town that had a lot of hype before it opened and even more so after it made it's official debut. The day after me and friend got a table there SFGate's Mr. Bauer raved about the place and a few weeks later SF Weekly's Anna Roth also heaped praise upon it. And, good or bad, I approached the place with these high expectations. Located in the old Paul K. space in Hayes Valley by they Sarah and Evan Rich, they've toned down the stuffiness and made it moderately relaxed and homey with that whole tile, wood and steel industrial look that is prevalent in new spaces opening these days. I feel like I'm becoming a regular at the SOMA StreatFood Park, sadly since the trucks rotate on a regular basis I haven't had the chance to establish a relationship with one truck like you do with a bartender so they can slip you a little extra booze, or in this case, meat on your sandwich. But then again, the good thing about rotating trucks is the chance to be able to try something new each time I go. This particular day me and the SO picked the same truck for a change--Naked Chorizo--a Spanish/Filipino food truck mix. 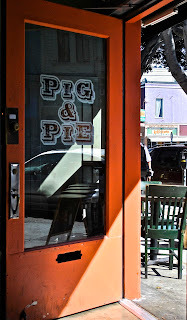 PIG & PIE SURE LET'S GIVE IT A TRY! There's an old saying that first impressions mean everything and so it was that I found myself in front of Pig & Pie on that lovely stretch of 24th street in the Mission District. My first impression of it was gladness that they kept the original facade of Discolandia, a Mission institution record store that used to inhabit the space. They merely added a small sign with their name--so points for that.